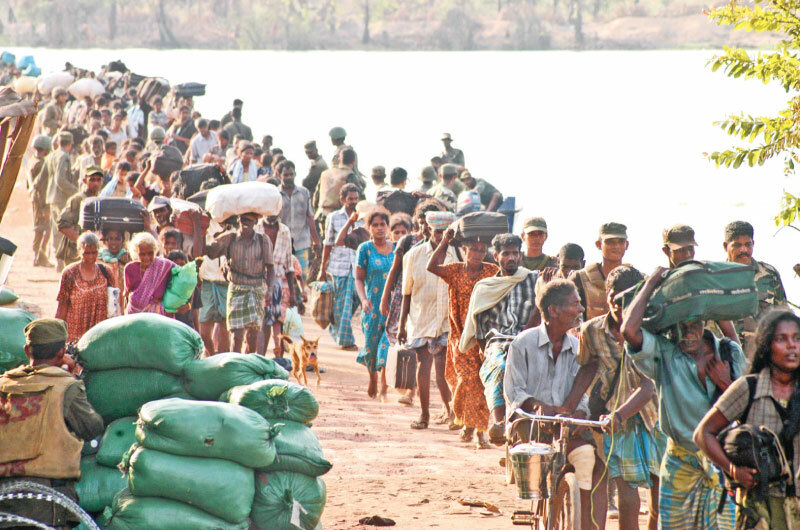 One of the major consequences of the Lankan civil war has been the internal and external displacement of people. The Tamil Diaspora abroad was estimated to be around one million in 2010, or one quarter of the entire Sri Lankan Tamil population (International Crisis Group, 2010a). Less has been documented of the psychosocial impact on family dynamics by the displacements; separations; death, disappearance or injury to bread winner, leaving high percentage of female headed households. Whole communities have been uprooted from familiar and traditional ecological contexts such as ways of life, villages, relationships, connectedness, social capital, structures and institutions. These results are termed “collective trauma” which has resulted in tearing of the social fabric, lack of social cohesion, disconnection, mistrust, hopelessness, dependency, lack of motivation, powerlessness and despondency. Other adverse post war consequences are shown by social parameters such as increased Suicide and Attempted Suicide rates; Gender Based Violence; Child Abuse; indebtedness; multiple partners and youth antisocial behaviour. It is difficult to imagine how the specific needs of massive numbers of victims can be addressed if the ability of the state to comply with its obligations is limited and there is a systemic lack of services for all citizens. A reparations policy on psychosocial support to victims needs to be accompanied by an improvement of the health care system in those areas where it is insufficient. This is one of the main challenges of reparations programming in contexts such as Peru, where guarantees of social and economic rights for citizens lag, making it is even more difficult to provide specialized services to individual victims that are distinctly reparative. Though there has been massive economic investment and infrastructure development post-war (PTF, 2013) in Sri Lanka, these peace dividends have not reached war affected communities, not aiding their economic or psychosocial recovery (Sarvananthan, 2012). Although nationally Sri Lanka achieved middle income status, there is a widening inequality as conflict affected areas in North and East areas remain below the poverty line (World Bank, 2016). Eight years after the ending of the war, legitimate reparation, community recovery and national reconciliation are yet to take place. Post-war issues causing on-going stress and difficulties for healing and reconciliation are tardy resettlement and return of land; poor regular income, lack of support to return to traditional occupations, few vocational opportunities, continuing militarization, paranoid inter-community relationships, and distrust in state, and non-state institutions and structures (CTF, 2017). The war in Sri Lanka caused changes at the family level in significant ways. The family is the basic structural unit of the Tamil society. The war has demolished this structure due to deaths (vacuum), separations, disturbances in family dynamics, change in the roles (death of father or mother). These effects must be considered in psycho-social rehabilitation for war affected communities. The effects of the war have been identified in the community level too. Whole communities have been uprooted from familiar and traditional ecological contexts such as ways of life, villages, relationships, connectedness, social capital, structures and institutions which has resulted in tearing of the social fabric, lack of social cohesion, disconnection, mistrust, hopelessness, lack of motivation, powerlessness and despondency (Somasundaram, 2010). This has resulted in widespread poverty, lack of initiative and motive to repair, work or earn, to return to pre-war functioning and income generating efforts. Adverse post-war consequences are shown by social parameters such as increased Suicide and Attempted Suicide rates; Gender Based Violence; Child Abuse; indebtedness; poverty, multiple partners, abysmal educational performances and youth antisocial behaviour (Somasundaram, 2013). Socio-economic rehabilitation, development and growth are essential as a part of community recovery. Unfortunately, the postwar, martial style of governance did not permit healing rituals such as mourning for dead, community rebuilding or psychosocial programmes (Samarasinghe, 2014). The community and its members need to be able to benefit from the developmental programmes being undertaken. Economic recovery will not be sufficient; people need ‘to reconstruct communities, re-establishing social norms and values’. International law recognizes the Principle of Restitutio ad integrum for the redress of victims of armed conflict to help them reconstitute their destroyed ‘life plan’. This justifies the need for rehabilitation as a form of reparation clarified by the UN ‘Basic Principles and Guidelines on the Right to a Remedy and Reparations for Victims’ as taking five forms: restitution, compensation, rehabilitation, satisfaction and guarantees of non-repetition (UN General Assembly 2005). Rehabilitation should include psychosocial rehabilitation at the individual, family and community levels. In a study after the Tsunami to find out the reason for failure of livelihood support, out of 160 beneficiaries affected by psychosocial problems, 50% were provided psychosocial intervention and livelihood support, rest of 50% were only provided livelihood support without psychosocial intervention. After nine months, their improvements were evaluated, 60% with the livelihood support and psychosocial interventions showed very good recovery while 28% were successful at an ordinary level. On the other hand, in participants who received livelihood support without psychosocial intervention, less than 42% had recovered. The important lesson was that implementing livelihood support, the psychosocial problems of the beneficiaries must be dealt properly; then only the success rate of livelihood and development support will be useful to the community. Without psychosocial wellbeing and recovery, implementing livelihood support and development will not bring expected better outcomes. International development efforts elsewhere in post conflict contexts have increasingly adopted holistic approaches that have included psychosocial recovery and rehabilitation through Training of Trainers (TOT) to widely disseminate basic knowledge and skills to affected populations. In Sri Lanka, the Office of National Unity and Reconciliation (ONUR) has sponsored the first of these efforts. We have embarked on a strategy for post conflict recovery and development based on a public Mental Health and Psychosocial Support (MHPSS) approach. Mixed methods were used to study the effectiveness of psychosocial interventions and rehabilitation. Initial findings from the implementation stage are reported. The Government of Sri Lanka established the Office for National Unity and Reconciliation (ONUR) in 2015 to plan and work to achieve national unity and reconciliation. Subsequently, A Task Force on Psycho-social Well-being was set up to address the mental health and psychosocial consequences of the conflict and to develop psychosocial strategies for national reconciliation. A major proposal put forward by the Task Force was to implement a Training of Trainers in Psychosocial work. For this purpose, the protocol developed by Joop de Jong of the Transcultural Psychosocial Organization, a WHO collaborating centre, working around the world to relieve the psychosocial problems of people affected by internal conflict and war (de Jong, 2002, De Jong, 2011) that one of the authors had the opportunity to implement in Cambodia (Van de Put et al., 1997) and Jaffna (Somasundaram and Jamunanantha, 2002), in which one of the authors was a trainee, was adapted. Government, Non-Governmental workers were to be trained to train government, Non-government and village resources (Core Group volunteers) to address the MHPSS needs of people using individual, family and community level interventions. The training uses evidence based best practice including psychological first aid, psychoeducation, counselling, family and women empowerment group work, child and youth support and activities; testimonial and narrative methods, ventilation through creative arts and drama; Problem Management, Psychosocial support for Transitional Justice and reconciliation processes. It also includes traditional methods such as calming techniques, memorialization and healing rituals as well as promoting inherent strengths and resilience factors to rebuild communities through intersectoral collaborations and networking for education, nutrition, livelihoods, income generation, vocational training, legal aid, housing and other facilities. For long term sustainability and effectiveness, it was felt that the capacity for psychosocial work had to be developed within the state structures and institutions functioning at the ground level, particularly in the war affected areas. In view of the widespread traumatisation and consequences of the war, affecting large number of the population, the Task Force identified state officers working at the Divisional level as those dealing directly with the public and thus most suitable to target for the psychosocial training. Each divisional level has over 35 categories where graduates are appointed to carry out various grassroot services.